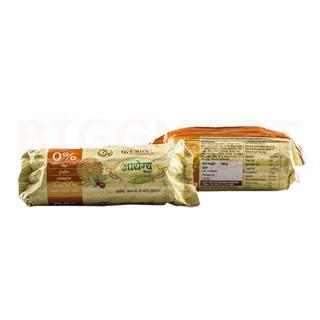 Patanjali Aarogya biscuits consist of wheat flour, with nofarina (maida) content, with no trisphate and cholesterol contents, to theguests. If it is given to the childs, it supplements nutritious elements andwater contents in the body. It also improves the energy level of the body. Itis easily digestible even for children and beneficial in constipation andstomach diseases. It has honey, which helps in strengthening brain power of thechildren, while it also supplies vitamin A.